In many places you have to travel far away from urban centers to reach unspoiled landscapes. Anchorage, Alaska is different. Unlike cities of similar size, Anchorage is an “island” city surrounded by wilderness expanses of mountains, forests and marine waters. Quintessential Alaskan landscapes are abundant right out the back door of Alaska’s largest city. 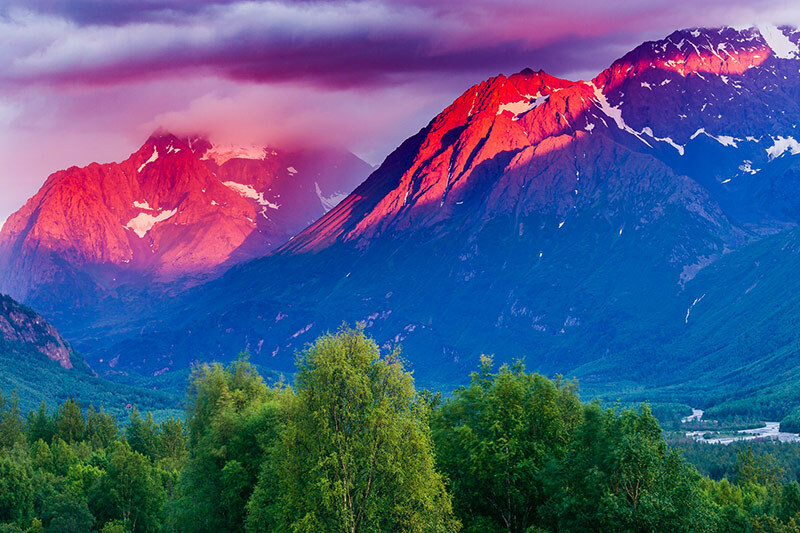 If you’ve never been to Alaska before, you won’t be disappointed with the Chugach Mountains and Kenai Peninsula. I’ve traveled statewide on commercial assignments and wilderness adventures for 30 years. Every time I returned from an epic journey to far and remote reaches of Alaska I was delightfully reminded that some of the best landscapes Alaska has to offer were right out my back door! The majority of my successful stock sales to national media and advertising were made within 100 miles of home. 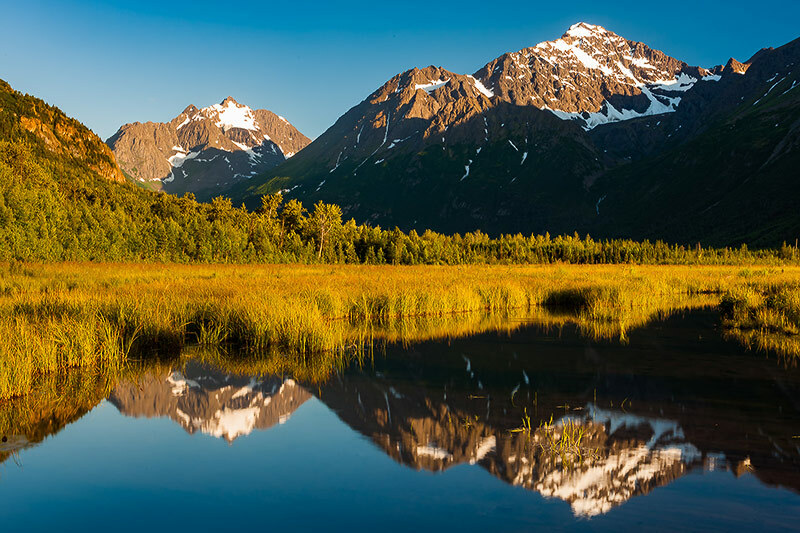 Anchorage’s “back yard” is Chugach State Park, a 495,204-acre wilderness of rugged glaciated mountain scenery. By comparison, Rocky Mountain National Park is 265,769 acres with 3 million annual visitors. Annual visitation to Chugach State Park is a fraction of that. An Anchorage based photo trip is easy. You get the best of both worlds – abundant wilderness landscapes and modern amenities. Daily flights are abundant from multiple airlines. Rental cars and RVs are in high demand so plan early. There are plenty of places to stay or camp around Anchorage and along the Seward Highway. The Seward Highway, the only road south of Anchorage, leads to Seward on Alaska’s Kenai Peninsula. The 120-mile route passes through steep, lush green mountains, and travels along fjords, rivers and lakes. 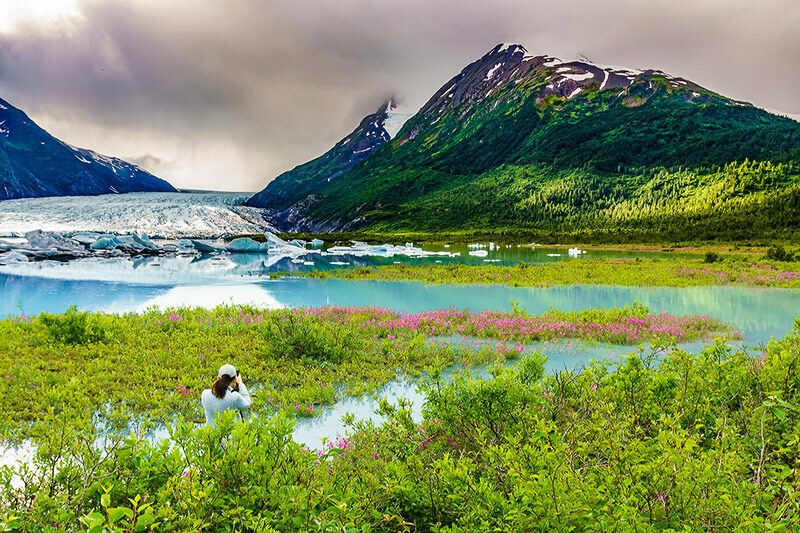 Two spur roads worth exploring are the Alyeska Highway to the ski town of Girdwood, and the Portage to Whittier Highway, terminating at Whittier, the gateway to western Prince William Sound. Reaching Whittier involves a tolled tunnel crossing with limited hours. The Seward Highway is always busy in summer but you will NEVER find crowds of photographers anywhere up here. You can have a great time working landscapes off the road system but the best stuff is a short distance off highway. There are two ways to do this and both are worthwhile. The first is to splurge on boat charters or air taxi to fantastic fjords and glaciers from Seward or Whittier. The Alaska Railroad also stops at several wilderness locations worth seeing and shooting. The second way, my favorite, is via hiking. 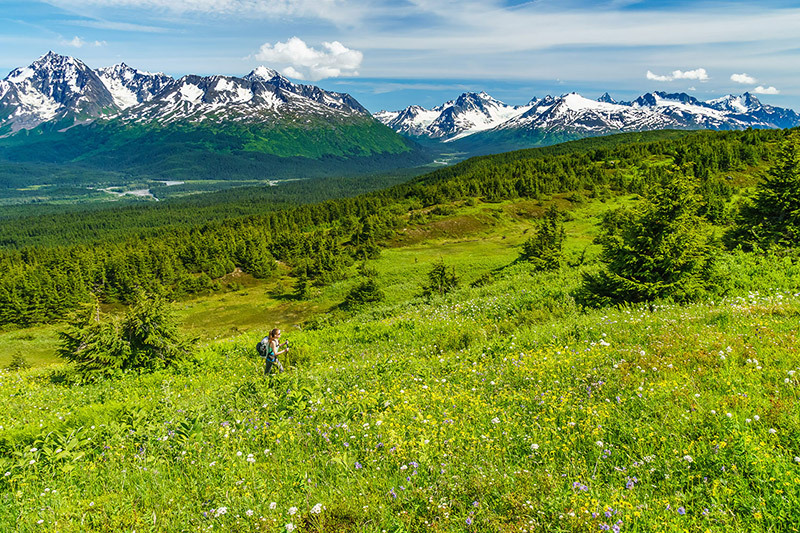 Chugach State Park and the Kenai Peninsula contain the vast majority of Alaska’s hiking trails. The photo trails described below are popular, well marked, easy to reach by passenger car and easy to follow that lead to spectacular landscapes. These and other trails are easy to research on Google. Books and maps are available at REI in Anchorage. Garmin inReach and SPOT devices work well in remote areas. Though there are other trail users, you will not find Delicate Arch photo crowds anywhere. From mid-May to early August, you shouldn’t need a headlamp. You can shoot last sunlight several miles from your vehicle with little concern of getting lost in the dark on your return. I’ve been doing this regularly for 30 years. Except for Bird Ridge, filterable water is abundant on these hikes. I rarely carry more than a liter leaving more room for a short tele like a 70-200. Luckily, dehydration and heat related injuries are not an issue here. With tree line at 2000’ getting into alpine vistas does not involve oxygen deprivation. Lightning is extremely rare in the coastal mountains. No feature about the Alaska backcountry is complete without some commentary on bears. Both black and grizzly bears live here. Bear encounters on hiking trails are rare and, in my experience, hiking in Southcentral Alaska is safe. I carry pepper spray, make noise where appropriate and just pay attention. I have no reservations about hiking alone. Hypothermia, a bigger threat than bears, is easily mitigated with proper apparel and knowledge. Here are some of my favorite and most productive photo locations. 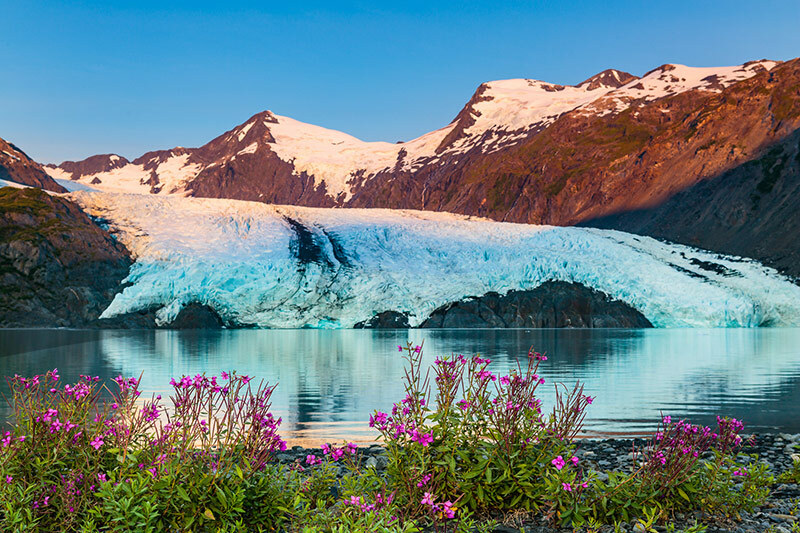 Western Prince William Sound: Lazy Otter Charters out of Whittier can take you to striking locations with photo ops of marine wildlife, tidewater glaciers and huge mountains. They can do beach landings so you are not restricted to only photographing from the water. My favorite location is Harriman Fjord. The mountains on the mainland rise sharply 8000-9600’ from sea level. Spencer Glacier via Alaska Railroad. Catch the train from Anchorage, Girdwood, or Portage and travel to the remote Spencer Whistle Stop. Here you will find new Chugach National Forest infrastructure including trails, campground and restrooms. Take the 1-mile trail to the lake with great views of icebergs in Spencer Lake and Spencer Glacier. In July there are prolific blooms of lakeside fireweed. Camp overnight or take the train back the same day. You get nice backlight in the morning and direct light in late day. For more adventure, Ascending Path does paddling and glacier hiking tours here. 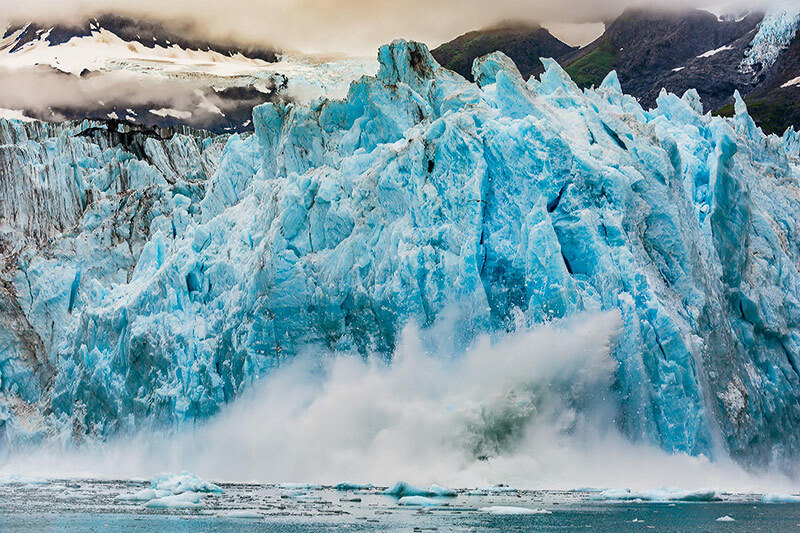 Shoot icebergs from a kayak and safely shoot directly from the glacier. We partner with them for photography tours. 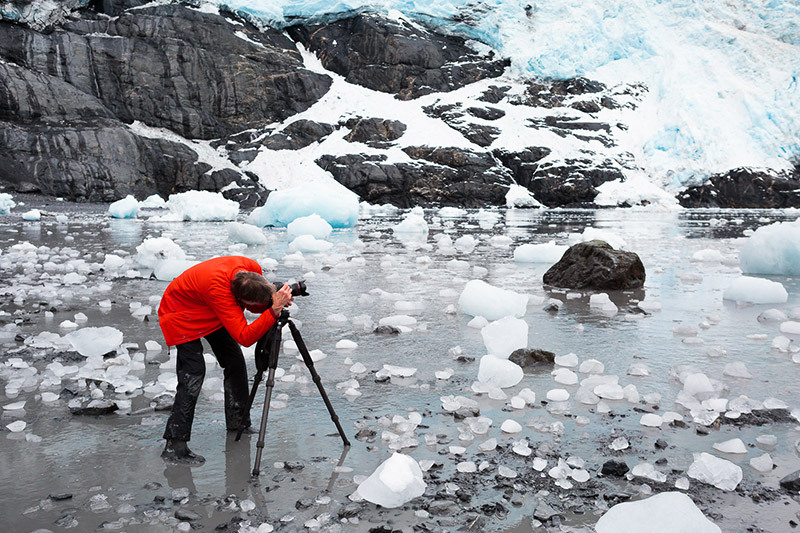 Photographing Spencer Glacier and Lake, reachable from the remote Spencer Whistle stop in the Chugach National Forest. Resurrection Bay and Kenai Fjords National Park. One of the main activities from Seward is boat tours into the park. For the best photo potential arrange a small boat tour with Alaska Saltwater Safaris or Mariah Tours. They do photo specific tours. In addition to the stellar tidewater glacier landscapes, good potential exists for seeing marine wildlife including orca and humpback whales, sea otters and Stellar sea lions. Hike-to locations from easy strolls to thigh burners. Short and Sweet: Easy walks, short distances from parking. 1. Eagle River Valley Nature Center, Chugach State Park at the end of Eagle River Road. Hike on a wide smooth trail to a viewing deck over the clear North Fork of Eagle River to a phenomenal mountain view. Eagle and Polar Bear peaks rise 6000 feet off the valley floor with an open view in otherwise dense boreal forest. In June or July, beautiful evening light bathes the landscape around 9:30 to 10:30 pm. 2. Trail of Blue Ice, Chugach National Forest. A mile after turning onto the Portage to Whittier Road turn left into Moose Flats Day Use Area. The 7-mile Trail of Blue Ice, a paved bike/hike trail, parallels the road to the Visitor Center. The Moose Ponds are shallow and on clear summer mornings produce steam, which enhances morning images. Walk a few hundred yards around the west end of the pond to a viewing deck with a commanding view of Explorer Glacier and the surrounding Peaks. Back at the parking lot, walk the trail east for a few hundred yards on a bridge to an open marsh and more sweeping views. At the viewing deck, early morning and evening produce nice light. 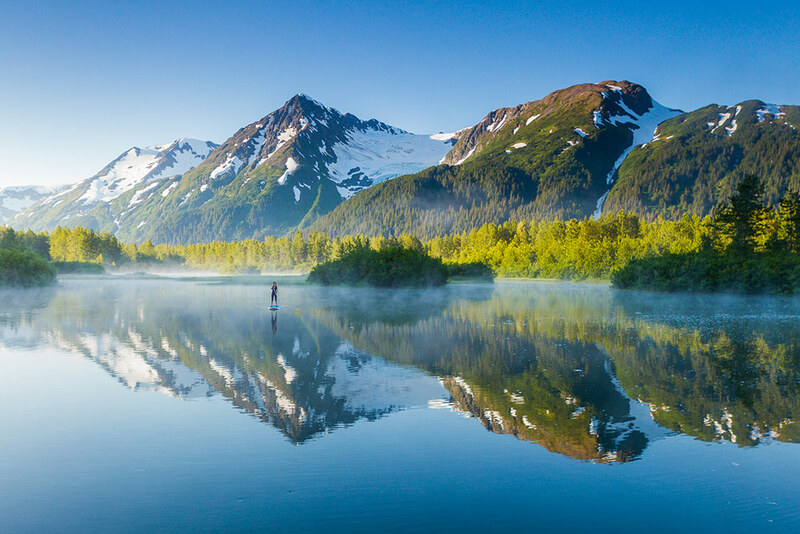 July sunrise view from Moose Ponds in Portage Valley, with stand up paddle boarder, Chugach National Forest, Alaska. Stretch Your Legs and Sweat a Little. 2-4 hours hikes worth doing. 3. 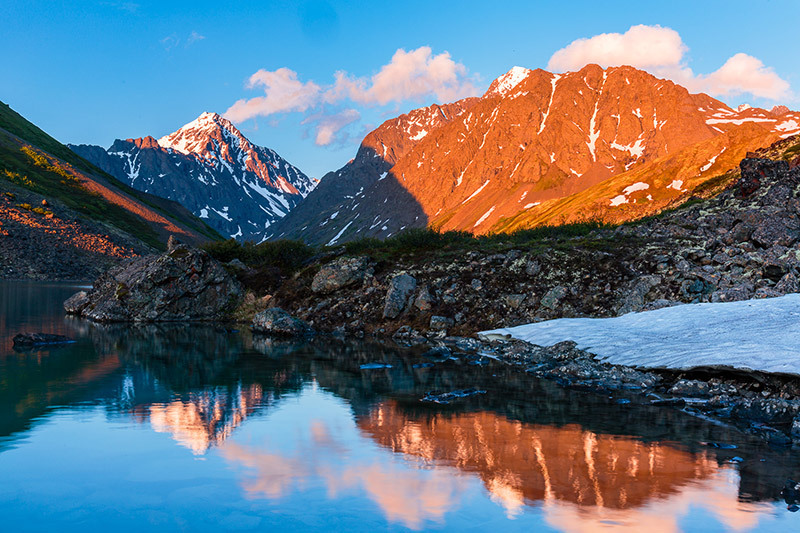 Portage Pass and Lake, Chugach National Forest. You can’t see Portage Glacier from the Visitor Center anymore. The scenery of the lake is nice but the place to be for a commanding view of the Portage Glacier is from the southeast road less end of Portage Lake. There are two ways to reach it. Either way it’s 4 miles round trip. You can paddle there along the northwest shore if you have your own kayak or canoe but the water is deadly cold with almost no place to land between the launch and lake’s end. Hiking gives you more photo options with great views from the pass, 1-mile and 800’ up from the trailhead. Descend another mile to the lake where in late July there are sizable fields of fireweed in a normal year. 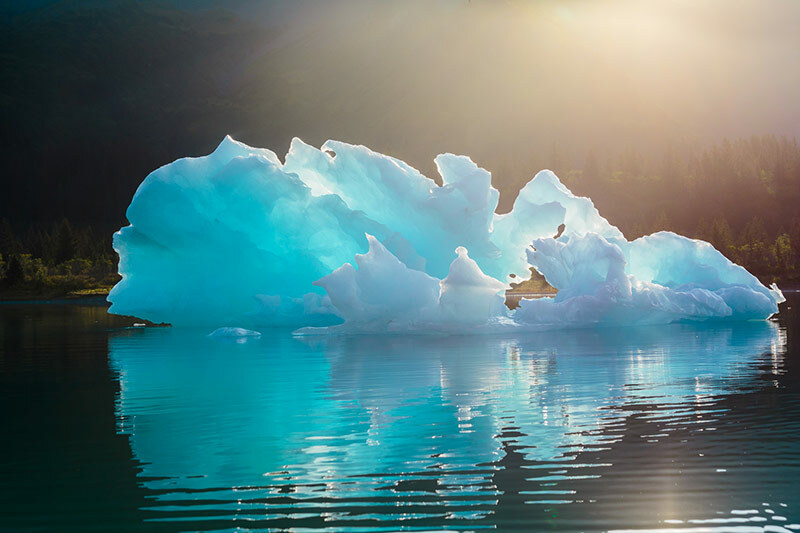 Unfortunately, due to Portage Glacier receding, it is rare to see icebergs in Portage Lake but the views are still photogenic. Sunrise View of Portage Glacier and Portage Lake, Chugach Mountains. River beauty (dwarf fireweed) fields in foreground, Chugach National Forest, Chugach Mountains, Alaska. To reach the trailhead turn right past the restrooms after exiting the tunnel on the Whittier side. The light on the pass and the lake is great in the morning and evening, but the light on the glacier itself is best in the morning. For evening shoots, pay attention to the tunnel schedule or you might be spending the night in Whittier. For morning light on the glacier start hiking about 1 hour before sunrise. A 70-200mm lens is great for more impactful shots of the glacier. 4. Winner Creek Gorge, Chugach National Forest. This is a great location for those drizzly days when the light is nice in the forest. Off the Crow Creek Mine Road in Girdwood, there is a developed trailhead to reach Winner Creek Gorge. You cross Glacier Creek via a hand tram, a little slice of Alaska adventure in its own rite. Shortly after the crossing, you reach a foot bridge over Winner Creek, with glacier blue water and moss covered canyon walls. You’re Gonna be Hurtin’ for Certain. These are strenuous photo hikes with a 6 hour + commitment. Most photographers don’t expend that much energy for photos so these destinations almost guarantee a photo exclusive that day. Late June on Bird Ridge, Chugach State Park, Alaska. This is the last light before the sun sinks behind a ridge at 10:45pm. 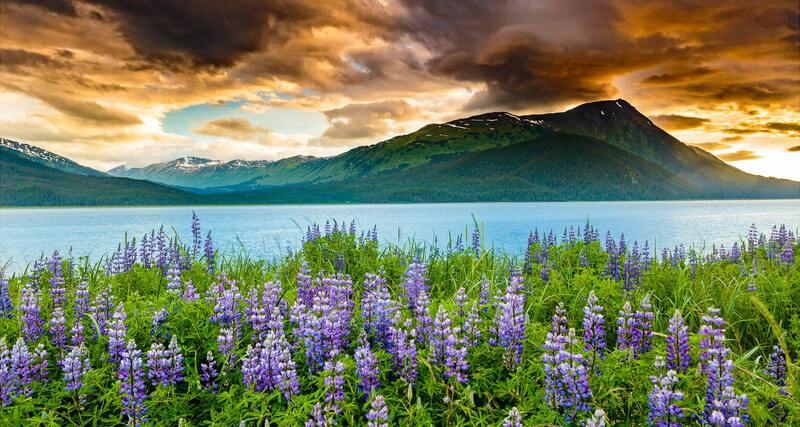 Lupine and coastal paintbrush line the trail with Turnagain Arm and the Kenai Mountains. 5. Bird Ridge, Chugach State Park. 5 miles round trip and a 3400’ climb. Alaskans don’t believe in switchbacks. Bird Ridge is the quintessential “quad killer” hike near Anchorage. From the summit great images surround you. 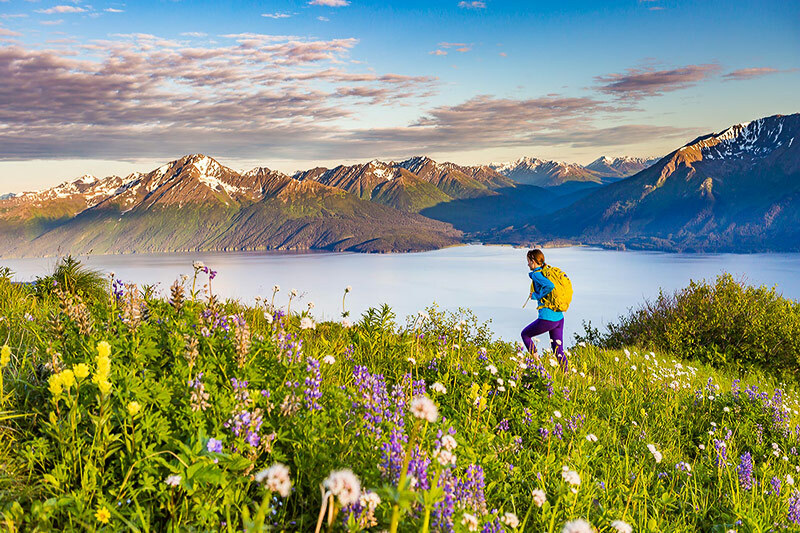 In mid-June and July, wildflowers are abundant as are sweeping views of Turnagain Arm below. Beyond the summit the towering peaks of Chugach State Park go on forever. Evening has the best light. Go light and bring trekking poles. Your knees will thank you on the way down. 6. Eagle and Symphony Lakes, Chugach State Park. 12 miles round trip with about 1500’ elevation change. The end of the trail is where it gets really spectacular. The hike starts at the South Fork Eagle River Trailhead. There are two lakes, lined by steep mountain walls. On the left is the glacial Eagle Lake. Sometimes the lake is beautiful turquoise and other times glacial gray. To the right is the clear Symphony Lake. Definitely an evening place. My favorite time here is late August with twinges of fall colors on the surrounding tundra. Shooting last light that late in the year means you might hike back in the dark. Bring a headlamp. Wear shoes you don’t mind getting wet because they will. I usually take just a 24-105 type lens. 11PM light of mid-June on Eagle Peak, left, and Cantata Peak from Eagle Lake in Chugach State Park. This location is about 5 miles from the South Fork trailhead. 7. Lost Lake Trail, Chugach National Forest. 15 miles with 2000’ elevation gain. This is a point-to-point, north to south trail near Seward. The through hike requires a shuttle. If you can only do an out and back, I suggest doing it from the north end at Primrose Campground. Go early for the best light on the northeast face of Mt. Ascension. Words can’t describe the beauty of the landscape viewable from this trail. Though popular with trail runners, hikers and mountain bikers, especially on weekends, you are unlikely to see another tripod up there. The middle 7-miles where you’ll want to spend most of your time is continuous alpine meadows, small ponds, the turquoise blue Lost Lake and alpine peaks in every direction! Make it an overnighter and catch sunrise light too. I bring two lenses, a 24-70 and 70-200 full frame equivalent. 8. Harding Icefield Trail, Kenai Fjords National Park. 8.2 miles round trip with 3000’ elevation gain. 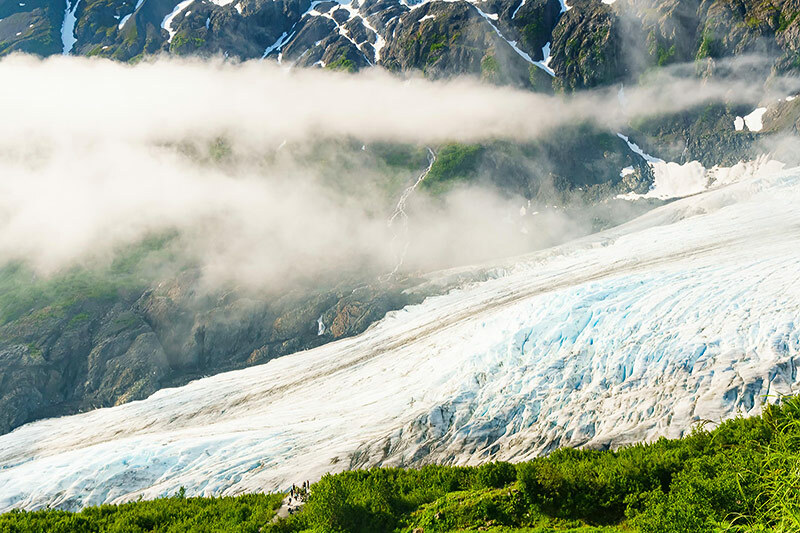 This gem in Kenai Fjords National Park gains 3000’ in 4 miles. You don’t have to go all the way to the top to get great views and images. The trailhead is at the end of the 10-mile long Exit Glacier Road, a few miles north of Seward. A paved trail leads south from the visitor’s center and Harding Icefield Trail exits stage right leaving most visitors below at the base of Exit Glacier. The trail winds steeply through cottonwood and hemlock forest before breaking into the lush alpine with phenomenal views of Exit Glacier, Resurrection Valley and surrounding peaks. Up top, the view of Harding Icefield is expansive. It’s a visually intoxicating scene with verdant green tundra and mountainsides in stark contrast with a sea of blue and white glacial ice. In June and July you will be crossing snowfields. Traction devices are beneficial. Make noise even above tree line. This is good bear habitat. The morning light is best. A view of Exit Glacier in morning light from the Harding Icefield Trail in Kenai Fjords National Park. If you are lucky enough to be in Harriman Fjord in Western Prince William Sound on a low tide, you can photograph icebergs with glacier and mountain backgrounds while they are stranded on the beach. The incoming tide is quick so have your escape route close by. 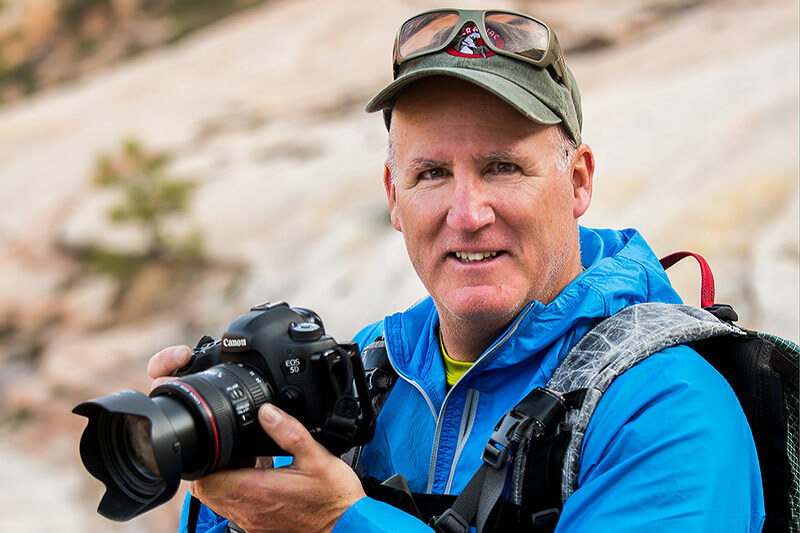 All of my camera bodies, 1D and 5D Canons, and my trail camera, the Sony A6300, are equipped with Really Right Stuff L-Brackets for quick and painless efficiency. My go-to tripods are the TVC-23 with a BH-40 for roadside and easy hikes and an old series one Gitzo, a1.5 lb tripod with a Really Right Stuff BH-25 head. I don’t use photo backpacks. I carry my gear in a pack designed for real hiking. Currently I use a Hyperlite Mountain Gear pack. Filters and accessories are carried in a Patagonia fly-fishing vest. The fishing vests are light and allow for backpack hip belts to be easily used. I carry my camera in a chest pouch with a custom harness system that attaches to 4 attachment points on the pack. Osprey makes some real nice lightweight chest pouches. I use the F-Stop Navin. Filters: There are three that I still regularly use for Alaska landscapes. 1) Polarizer – still relevant with all the water and wet vegetation. 2) Grad ND’s: The most useful up here is a 3-stop soft step that is often combined with a polarizer. 3) 6 or 8 stop ND: for creative use on waterfalls, creeks and tidal motion. Photographer Michael DeYoung, 2017 in Zion National Park, Utah. Michael and his wife and business partner, Lauri, frequently explore wilderness whitewater rivers and trails in Alaska, Europe, and the western U.S. Follow him on Instagram @michaeldeyoung. ← Winter Wildlife – Part 1 with Joseph M. Johnson Sr.